Moving beyond the buzz words. What are the key concepts that we all need to understand as we talk about and design inclusive education programs. Inclusive teaching practices. What are the current best practices in training teachers to reach learners who are differently-abled or are marginalized? Budgeting to center inclusion. 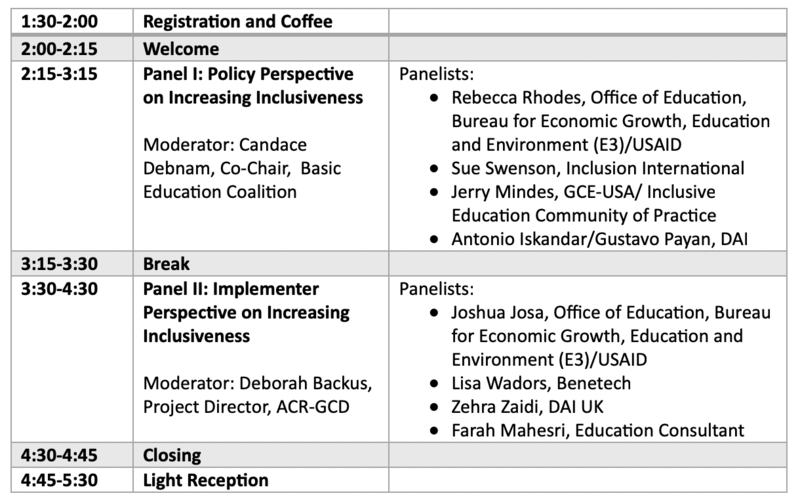 What have we learned about how governments and systems can help pay for inclusive education? Assistive and inclusive technology. What role does technology play in inclusive education for both differently-abled and marginalized learners and what’s next on the horizon? DAI is an international development consulting firm on a mission to transform ideas into action—and action into impact. We are committed to shaping a more livable world. Since 1970, DAI has worked in more than 150 countries—delivering results that matter across the spectrum of international development contexts, from stable societies and high-growth economies to challenging environments racked by conflict. In 2018, DAI launched its global education practice. Through this practice, DAI strengthens the provision of high-quality, inclusive education for children and youth around the world. DAI works hand-in-hand with educators, policy makers, communities, and stakeholders to implement local solutions, borrowing and building on ideas and innovations from across sectors and working to understand education systems as a whole. DAI supports partner countries to create safe learning environments for students of all ages to help them acquire 21st-century skills—literacy, STEM, vocational skills, and critical thinking—and promote their self-reliance.